Players are invited to take time out during the spring break as we play for $3,000 in fabulous prizes in the Spring Break Bingo Tourney, 2 weeks filled with bingo tourney fun. This year Easter falls in March and Cyber Bingo have a bumper Easter weekend filled with bingo excitement and fabulous cash prizes for players to win. The Easter Weekend Eggstravaganza takes place from Friday to Sunday over the Easter weekend and plays for up to $15,000 in cash prizes. 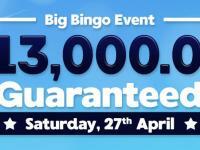 To add more great bingo fun to the Easter weekend, Saturday March 26th sees us play this month’s big bingo event, the $50,000 coverall, minimum $10,000 event that guarantees to create more big winners. A 2 week long Bingo Tourney themed to Spring Break. Top 20 players to bingo the most on the spring bingo pattern will win the Tournament. 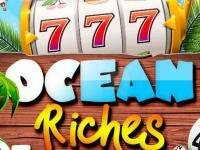 1st place winner will receive a cash prize of $1,000 while the other winners will receive consolation prizes. The Spring patterns will play once an hour in the Seasonal Room (Spring Room). Each time a player wins on one of the special bingo games they will automatically receive one (1) tourney point which will be added to their ranking. The more games a player wins the higher they will climb the tourney leaderboard. March 27th is Easter Sunday and therefore we will have a weekend special celebrating Easter. 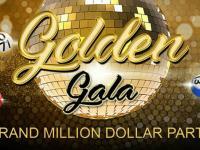 It will consist of $5,000 min $500 Coverall games playing Top of the Hour at 7:00PM ET each day in the Seasonal Room on March 25th-27th. The Games will have a card cost of $1.00 each and will also have a free cards promotion of “Buy 6 Get 3 Free”. The Games will play on Easter related patterns. 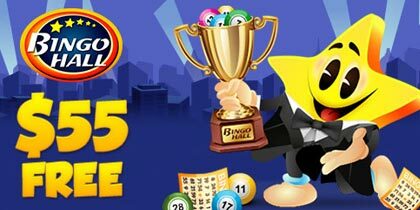 The Big Bingo Event is our biggest Monthly special which plays in the Bingo Tourney Room; where players are guaranteed some fantastic prizes. In the month of March, the Big Bingo Event will consist of the following games playing as Top of the Hour Games starting at 8:00PM ET. Join in the Easter weekend bingo fun and excitement as we play for fabulous cash prizes in our Easter Weekend EGGstravaganza! 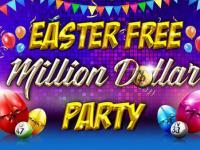 Join in the Easter bingo fun as we award up to $15,000 of cash prizes in our Easter Weekend EGGstravaganza. This great bingo event is held over the Easter weekend, Friday, March 25 at 7:00PM EDT, Saturday, March 26 at 7:00PM EDT and Sunday, March 27 at 7:00PM EDT in the Spring Bingo room and guarantees Easter bingo fun and excitment. Each day at 7:00PM EDT we will play one of our Easter Weekend EGGstravaganza $5,000 coverall, minimum $500 games on our Coverall Bingo Patterns. Cards for these fun filled Easter Weekend EGGstravaganza games cost just $1.00 a card. You can get more bingo fun and chances to win playing our Easter Weekend EGGstravaganza games with an incredible Buy 6 Get 3 free offer on all bingo cards. 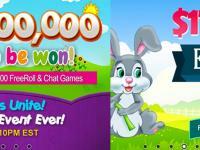 That’s amazing free chances to win up to $5,000 each game this Easter. All you have to do is select 9 bingo cards and you will only be charged for 6! 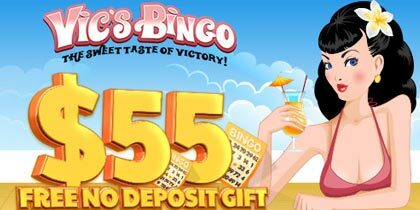 This incredible buy 6 get 3 free offer also works for pre bought bingo cards. Pre buy your Easter Weekend EGGstravaganza bingo cards today for your chance to win a share of up to $15,000 in cash prizes during the Easter weekend.